Kazakhstan: Nursultan Nazarbayev to follow the way of German Fuhrer? At the end of last week the parliament of Kazakhstan unanimously approved the decision to amend Constitution and the number of constitutional laws. 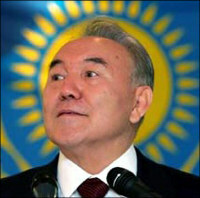 The goal of amendments was to offer Nursultan Nazarbayev the opportunity to stay as president until 2020 without running presidential elections. The deputies supported the idea of organizing the referendum on this topic. Therefore, the parliament formally overrode president’s veto on this draft law. On the other hand this was just performance, played many times. In 1998, violating the constitution (developed by himself), he wanted to be elected early. Last year the deputies initiated the law of National leader; after some "resistance" Nazarbayev gained this status. There is nothing new in such policy. Today, no leader in the world wants to look like "tyrant". Kazakhstani government spends dozens of millions of USD to produce positive image of the republic and its president. Mass media report Kazakhstan’s successes as the leader in democracy in Central Asia. Undoubtedly, the referendum is well identified with democracy! The employment of democratic institutes for the sake of authoritarian goals is well developed tool of many "national leaders". Adolf Hitler was also widely using the democracy mechanisms. Nazi won democratic elections, still not having vast majority of seats in the parliament. Their task was total rule. In 1930 Hitler said: "The Constitution recommends the methods, but not goals. We will try to gain big majority in legislative bodies through constitutional mechanisms in order to produce the state’s shape, fitting our ideas". On August 19, 1934 Hitler conducted the referendum on uniting the positions of president, Reichschancellor and party leader, where he gained 89.93% of votes in support. Nazarbayev is not Hitler, but the use of Nazi leader’s methods does not give credit to Kazakh President. There are many parallels between the actions of Hitler and Nazarbayev. The difference is that Hitler managed to totally transform Germany in historically short period of time while it took two dozens of years for Nazarbayev. Hitler openly used force against political opponents while Nazarbayev prefers less brutal methods. Hitler’s law On emergency powers is similar to Kazakh law On temporary delegation of additional powers to the President of the Republic of Kazakhstan and heads of local authorities, dated December 10, 1993. This norm granted exclusive power to Mr. Nazarbayev that contradicts principles of separation of power, theory and practice of modern democratic society. The president could "elect" higher judicial authorities (Supreme Court, Constitutional Court, Supreme Arbitration Court), appoint ministers, Prosecutor General and head of National Bank. It has to be mentioned that president also gained legislative power, issuing decrees with legal effect of laws (both usual and constitutional). Hitler did not let the communist to run in the parliamentary elections. The communist party of Kazakhstan was not also allowed to participate in the elections in March of 1994. Fuhrer (German), elbasy (Kazakh) and "national leader" are synonyms. As the head of communist party of Kazakhstan in Soviet period Nazarbayev adopted approaches and traditions of Soviet nomenclature. As a result, the authoritarian trends continue to prevail over democratic ones. At the same time, the government formally proclaims democratic values and republican rule. In real life, we feel strengthening of president’s dictatorship in additional to traditional, oriental-tyrannical values, personifying the nation with national leader. De facto the legitimization of Nazarbayev’s authoritarianism was always sold as optimal model of national development. In democratic system the state must create optimal conditions for open, transparent and non-violent competition (for instance, through voting at the elections). When the state de facto eliminates elections at constitutional level there can be no democracy. The denial of presidential elections is the violation of fundamental democratic values that prepares the ground for the risk that elites will turn into despotic group. This process is also risky for Kazakhstan: I am talking about secular nature of the state. So far this danger looks not very serious but it definitely cannot be ignored. Authoritarian rule in Kazakhstan is the evidence that the official efforts produced deformed and marginal multiparty system. The big reason is that presidential system does not want to share power with others. The presidential rule does not want to turn into party democracy. Any competent lawyer will say that referendum contradicts the multiparty system, reflected in the constitution of Kazakhstan. The elections are the tool to identify the public position on the course of various political parties. The dictatorship of one person and one party (Nur Otan) have no such "compass". During Nazarbayev’s rule Kazakhstan witnessed not modern but atavistic types of behavior because they helped strengthen the power of national leader. The authorities dominate the public in the traditional oriental society. The patriarchic system does not tolerate the competition with "youngsters". The political image of Nazarbayev includes hidden image of Wiseman and lord. In this image the population is instinctively looking for protection of frightening uncertainty: de facto political fatalism is employed here. Today, Kazakh president is real "superpatron", sharing political favoritism to all others and exploiting beliefs into holiness, special selectness, heroism and unreachable perfection of national leader, possessing unrivaled charisma. Based on these elements, Nazarbayev managed to dissolve the parliament in 1993 and 1995, promote constitutional reform in 1995 and win referendums and elections. Mass media present the image of president as the sole genuine law-maker, founder of independent state, national leader and good-doer. The cultivation of paternalistic type of mind separates people from real democracy. The mentality of Kazakh people became the trump card for authoritarian rulers. The government constructs the system of passive dependence of people from the will of elites. The public produces authoritarian stereotypes. The references to special mentality de facto prevent the development of democratic and legal state. "Tyrants are made by slaves" is a good phrase here. Today’s Nazarbayev does not differ much from first secretary of the communist party at the end of 1980s. This party controlled the resources of extensive country, facing no political competitors. The Secretary General of the communist party enjoyed big unrivaled power. The sustainability of this regime was not based on dismantlement and competition of various political forces, but one personified institution. In 1990s despite of innovations Central Asia retained this element of old regime – absolute power of one person. Old heritage was presented as democratic rhetoric. The presidential power was controlled neither by public nor by state institutions. It was still supported by other mechanisms of state machine and awarded maximum power and minimum responsibility. Today, Nazarbayev wants to have more – something the Fuhrer of German nation had.